Kalimera! I could do worse than start the day with peaches and Greek yoghurt, sitting on the terrace in the early morning sun. Having arrived in Athens late the night before, this was my first opportunity to glimpse something of its landscape, and to meet the UK IBBY team I had been invited to join. As a first impression, this was rather good. And when this friendly welcome was also extended at registration, both Alice and I knew we were in for a treat. Straight away it was clear there was a warmth here, observed in the way long term IBBY people from around the world greeted each other as friends. Standing in the queue, a newbie, it was lovely to see. It was clear that this would be more than a Congress, it would be a meeting of hearts and minds. This may sound naïve; obviously there are always differences in approach, but essentially this genuinely seemed to be the case. Colleagues from around the globe milling together, in anticipation of what the next few days would bring in terms of ideas and insight. I was excited too. Keynote speeches and presentations all, in one way or another, proceeded to promote a common aim: the importance of allowing children to be children, through the medium of stories. Highlights were always going to be hearing Deborah Ellis in person, as well as Jeannie Baker’s insights into how she researches landscape and cultural setting for her beautiful collage wordless books. 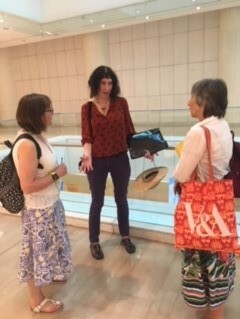 Chatting to her afterwards, along with IBBY UK’s Pam Dix, was a delight. But, possibly the most inspiring presentation came at the end of a long day, with Philippe Claudet describing how his team creates appropriate storybooks for visually impaired children. Especially wonderful is that their most recent publication has involved these children in the creation process, choosing their own materials to interpret story concepts, and to design and construct their own tactile illustrations. Another presenter challenged us to consider that reading is not for pleasure but to create a sense of responsibility; books should be ‘intellectually discomforting’ in order to raise questions in the reader’s mind. Whilst agreeing with the latter, I could not bring myself to agree with the former; surely our goal, fundamentally, as parents, librarians, and educators, is to inspire a love of reading, for reading’s sake. The social-cultural awareness angle can (and must) be developed as part of this approach, but never instead of nurturing a sense of wonder at where a well-written (and well-illustrated) book may take a child’s imagination. This thought links neatly with the presentation that Alice herself gave, looking at metaphors and imagery of colour and light in stories by Beverley Naidoo. Through the experiences and connections these colours evoke for the protagonists, the reader develops a sense of visual literacy through text. Interestingly, though, it turns out (through an interview Beverley gave to Alice earlier this summer) that this was not intended; it took the reader to make this unforeseen link, taking the quality of the storytelling, and its empathy with real-life experiences of inequality, to a deeper level. So, a snapshot of many first impressions to take away: of an organisation that feels like a family, of people who want children to receive the best that there is to offer, in homes, schools and libraries across the world, and of the IBBY vision which will be satisfied with nothing less. A delight – and a privilege – to have been involved.